Slide 2 starts off with a low-angle gully that is less than 50 feet wide. 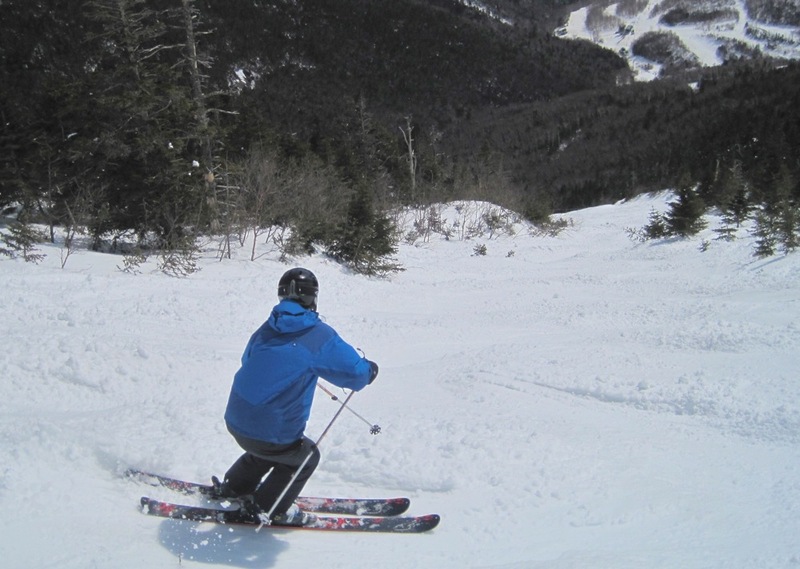 Its high eastern exposure keeps the snow soft longer often resulting in some high-elevation mogul skiing. The gully is relatively short and quickly dumps out at the top left of the Slide 1 headwall which is clearly visible by following the natural fall line in the photo below. There is a nice rock bulge just before the bottom of the gully on skier’s right which will launch you out and onto the wide expanse of Slide 1 above the headwall. If you stay on skier’s left to avoid the headwall, the middle section of Slide 2 is tight, steep, fun trees. Some of the steepest sections of the slides are found in this zone. Trust yourself and keep looking ahead to find the openings. Skier’s right gives you the option to pop out of the trees onto the headwall of Slide 1. The middle tree zone is much more open after the rains that fell in late May 2011. Arguably the ensuing landslide improved the tree skiing in this section of the slide and many consider this to be the best part of Slide 2.. The trees that remain are nicely spaced and anchored into this challenging pitch. At this point you could stay in the fall line to rapidly descend through the fir wave to reach bottom of slides or you can traverse skier’s left to ride the new terrain of Slide 2B or the classic rock steps and chutes of Slide 3. Slide 2 is somewhat reminiscent of Empire. It’s much tighter than Slide 1 and holds snow well.